Worth a dollar, but not the Wipeout clone we expected. 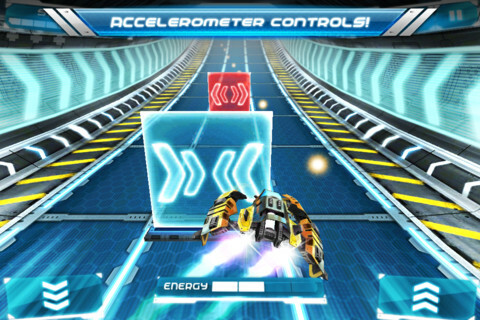 There's a lack of futuristic racing games on the App Store, so excuse us for getting excited for Ion Racer. Screenshots immediately brought to mind Sony's award-winning Wipeout franchise, and we dreamed of enjoying a little neon nirvana on iPhone and iPad. Those dreams were somewhat crushed, since Ion Racer feels more like a bonus mini-game and not a full-fledged title. It's good, no question, but SGN's creation left us wanting more. In fact, the title is somewhat misleading, since you never race against anyone, not even computer opponents. Here, it's all about building speed while weaving between gates and picking up gold orbs along the way. You can smash through dangerous red gates by pressing the right side of the screen (AKA Strike Mode), or go into Focus Mode to slow things down for added maneuverability. Meanwhile, destroying blue gates results in more points or repairs for the hovercraft. It all amounts to going as fast as possible and clearing objectives (race for a minute, reach a specific distance) before eventually slamming into a red gate and subsequently exploding, whereupon which you restart from the beginning. Not exactly the feature-filled experience we hoped for, but entertaining enough to warrant spending a buck. The developers even threw in upgrades in the form of shields, increased agility and an ion magnet that inhales those aforementioned orbs, along with perks, such as auto repair, a score multiplier and other goodies. You'll need Kions, the game's currency, to purchase them all, which requires grinding. Of course, if that sounds like a chore, SGN is more than happy to offer Kions at various prices. On the downside, we don't like the marketing speak on the game's App Store page, where the creators boast of a "multi-dimensional retina display." Ion Racer looks decent, with a tunnel that changes colors and some cool vehicles, but there's no way this game takes advantage of the new iPad's screen. Everything looks pixelated. Finally, the touch controls feel too sensitive and take a while getting used to. Instead, go with the superior tilt controls that offer increased precision. Besides, using your device as a steering wheel feels more intuitive. We don't mean to be too hard on Ion Racer, because it certainly delivers a pleasurable experience, but it's also a proverbial one-trick pony, a game you'll probably check out for a few days and then discard. With that in mind, let's hope SGN rolls out some updates in the not too distant future. 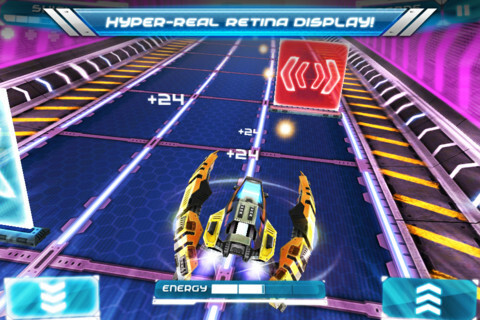 What's Hot: Cool Wipeout style visuals, fun tilt controls, bonus objectives. What's Not: Disappointing touch controls, no racing to speak of, a lot of grinding to afford the best perks and upgrades.